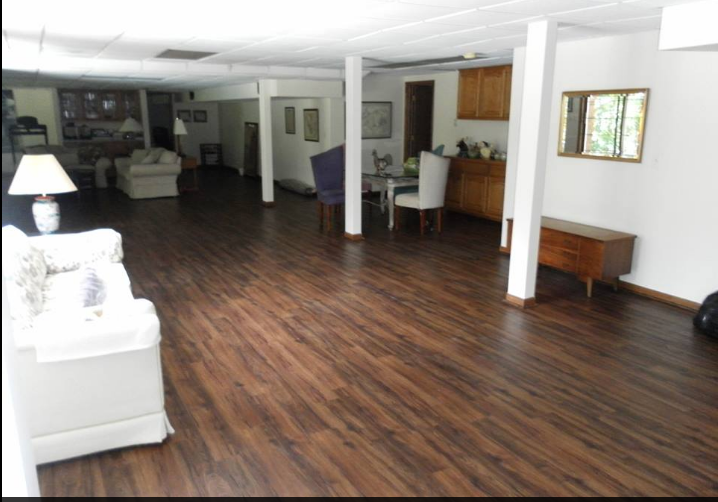 ​ LAMINATE FLOORING Laminate flooring is the great copycat for anyone looking to have their flooring project come to life within their financial means. Laminate flooring has especially been a go-to for a number of reasons in the most recent years. The ease of install, durability and versatile options are only a few reasons why it has become so popular. However, laminate flooring may not be ideal from your home or office under a number of circumstances. Follow our guide on what you should know before purchasing laminate for your next flooring project. We will bring a ton of floor samples so you can take your time and see immediately how a floor will look with your existing walls, furniture, and decor in your home. What that means to you is that there is no middle-man to pay. We buy directly from the mill and pass the savings directly on to you. Laminate flooring is not composed of any real hardwood material at all. In fact, the top layer, or decorative layer, is actually a highly rendered photograph that is sealed by a resin-based coating which gives the laminate flooring board its resistance to the many forms of abrasion. The two remaining layers of laminate flooring are the core layer and the backing layer or otherwise known as the stabilizing layer, which helps to bind all three layers together. Most laminate flooring is efficient and mess-free due to its ability to be fitted together and secured without the help of glue. An underlayment material sheet is rolled onto the floor and the laminate tiles or planks are snapped into one another. Other laminate options do require glue but do not require any nails, unlike hardwood flooring, which is often a time saving option. Usually, an entire room can be finished in about a day or two for those do-it-yourselfers, and even a shorter amount of time is required for the professional laminate installers. Installing laminate flooriing can be a piece of cake for most customers in fact; laminate flooring can be installed over most existing floors in your home of office with the exception of carpet. Moisture barriers and general water prevention are required to install any laminate flooring, and once that's taken care of practically any grade of laminate can be installed. Although laminate can be quite appealing to the eye due to the hundreds of stone, ceramic and wood tile and plank options, it will never bring you the comfort that carpet can because it is quite hard and unyielding to the foot. Hardness is simply a characteristic of laminate that usually cannot be alleviated by cork or foam padding on the back on the decorative layer. ​Laminate flooring is mold resistant, stain resistant as well as durable which makes it perfect for living rooms, hallways and entryways that receive a ton of foot traffic. Laminate flooring can even be manufactured with certain water resistant laminates making it appropriate for heavy water rooms such as your laundry room, bathrooms, and kitchens. If you wanted to take it a step further, laminate flooring can be coated with allergen resistant and anti-bacterial treatments to make them even safer. Although laminate can stimulate the look of real hardwood, stone or brick picture perfect, it does not have any natural texture to it which may be an illusion some customers would rather not have. Another thing to consider when browsing laminate options is the refinishing. As stated above, laminate flooring together with three different layers that all serve their own purpose to the total build of the flooring and the top layer, or decorative layer, cannot be refinished. Over time the wear and tear on the floor can degrade and ruin the decorative layer which will then need to be entirely replaced. Some customers may find that laminate flooring is perfect for their home bathroom, kitchen or their office bathroom or kitchen but there area few things to consider before you think about installing laminate flooring in your home or office. One of the biggest complaints regarding laminate flooring is the curling of the tile or splitting of the tiles due to water damage. Even if you apply a water resistant adhesive to your laminate tiling it will wear eventually and it is not 100% resistant to water. Curling is when the tiles react to water by curling upward destroying the entire effect of the floor. De-lamination is also something that can be caused due to liquid damage. De-lamination is when the adhesive within the different layers of the tiling causes the tile to split entirely which will result in the necessary replacement of the flooring. Maintaining and cleaning your laminate floors in your home or office couldn't be easier! Typically, sweeping or vacuuming the floor, and mopping from time to time will easily remove the dirt and grit which if you aren't careful, can slowly ruin the decorative layer of the laminate flooring over time.